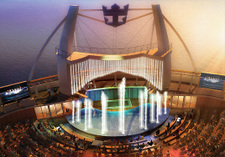 Oasis of the Seas: What is an AquaTheater? 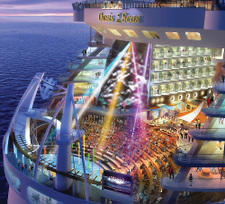 The Innovation of Oasis of the Seas (and the Genesis project) is its mixed use of space. In other words, features get used differently depending on the time of day. Located at the aft (rear) of the Boardwalk Neighborhood is the AquaTheater. During the day, the theater itself is a giant pool. I like that the pool is located in the aft section. It is almost like resort located at the edge of a cliff overlooking the ocean. And, I think it will be more functional than in the midsection taking up pedestrian walking room. At night, the AquaTheater comes alive as the entertainment venue for all the shows. Not just your typical stage shows, the open canopy allows for acrobatic shows! I hope there will be Cirque du Soleil-type or chinese acrobat shows. That would be a treat for me. (I am a little tired of the regular stage shows.) Literaly, the sky is the limit for this outdoor entertainment. Water and light shows are also promissed as only an outdoor venue can provide. And, there are other functions that occupy this space. For example, 2 rock walls flank the AquaTheater. All in all, the AquaTheater at the end of the Boardwalk Neighborhood on the Oasis of the Seas is the entertainment climax and a truly revolutionary use of space. An oversized pool during the day and an outdoor ampitheatre at night, with multiple entertainment uses throughout.